I have a work in progress report two more Diamond quilt blocks. I start a little happy dance with each one of these posts I write as it means I am getting closer to completing this quilt. I feel getting a couple of more blocks done is quite a feet as Christmas preparations and activities does slow me down. Next week I get to be Mum again as Eve is home for Christmas. I broke with routine a little this week and chose a light diamond to work on. 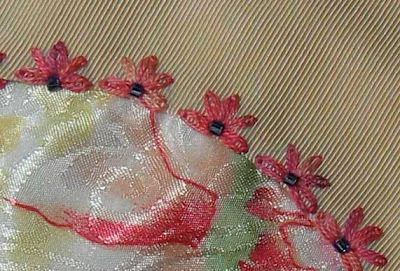 This first detail is a seam which I have worked Detached chain stitches in a silk thread which is the the same thickness of perle 8. The small floral motifs are completed with a bead in the middle. I also used detached chain stitch to secure the scallops of the doily to the block. 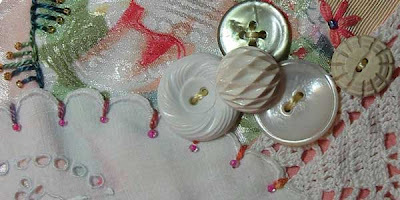 This detail also shows a cluster of vintage buttons. 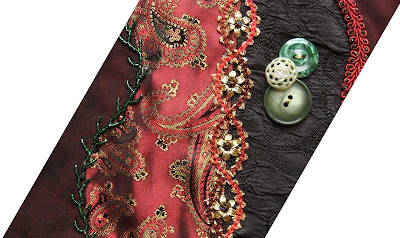 Straight stitch and detached chain form little motifs that edge a folded ribbon braid running down a seam. These are also stitched using a hand dyed silk thread. This is a simple block for me yet is it made up of strong dark colours. I have been asked how I do this beaded feather stitch. Stay tuned for a tutorial in the next 10 days. Well thinking it it through sometime before Christmas I will photograph it and write it up so stay tuned as I will illustrate it. As usual click on the images and it will take you to a larger version. Once on that page if you click on the magnify icon in the top right hand area of the picture section, it will often take you to a larger image again. Ohhhh Sharon I just LOVE your diamond shaped blocks and especially those small metal looking hearts. Are these buttons or charms or what??? Exquisite definitely! The diamonds measure 15 cm (6 inches) across the middle on short crossing and 27 cm (10.5 inches) across the long section . Beautiful. The buttons are such a nice touch. Sharon, more great diamonds. I have thorougly enjoyed watching the progress on this and going back and watching it again and again. I have always been intrigued with you "I dropped the Button Box" quilt and even made a feeble attempt using my small collection of buttons. It’s on my Flicker site – just please don’t laugh. I actually think I like the diamonds better, maybe it’s just newer? I hope you don’t mind if I too make some diamonds one of these days. I do have a question, what size are you making your diamonds. 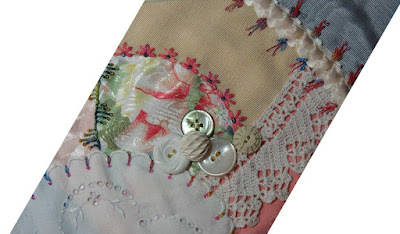 The pinks and the vintage doilies in these blocks are really lovely. Do you use a hoop when embroidering these blocks? Maybe you’re of the no-hoop school. I love the diamond blocks. I really must try some crazy quilting as is is such a good place to include embroidery. Hi Sharon, These are more beautiful eye candy. What a wonderful quilt this will be when it is finished. You’ve probably told us before, but what size is each diamond? Just curious. Saw a couple of clowns from the Circus School on TV this week and wondered if Eve would be there as well but no such luck. I’m sure you will enjoy having her home. Isn’t it great the feeling you get when you know a project is coming to end, the feelings of satisfaction and achievement plus the knowledge you are now free to explore that other great idea that has occurred whilst you are busy doing the current project. I know, you are like most creative people who work on several projects at a time but there is always that other project that has wait for one of the others to be done before you start a new one. Hope you can get a couple more blocks done before Eve arrives. Although I cannot get into quilting, crazy quilting or any other sort of quilting, (despite working in a fabric store) I really love all the individual blocks you do and look forward to seeing the complete quilt.